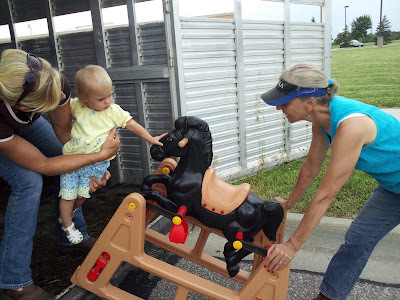 The Seevers Family Blog: We Bought Nyla A Horse Today!! Aunt Karen, Patty and I traveled all the way to Lincoln with the horse trailer today to buy Nyla a new horse! Haha!!! Well, we actually went to look at a real horse but first stopped off to pick up a "Today's Kids Rock-n-Bounce Pony" I purchased for Nyla on Craig's List. Couldn't pass pass up the photo op!